gineering, Faculty of Engineering and Physical Sciences, University of Surrey, Guildford, UK. Received January 3rd, 2010; revised February 3rd, 2010; accepted February 3rd, 2010.
to humic acid and then high removal efficien cy. 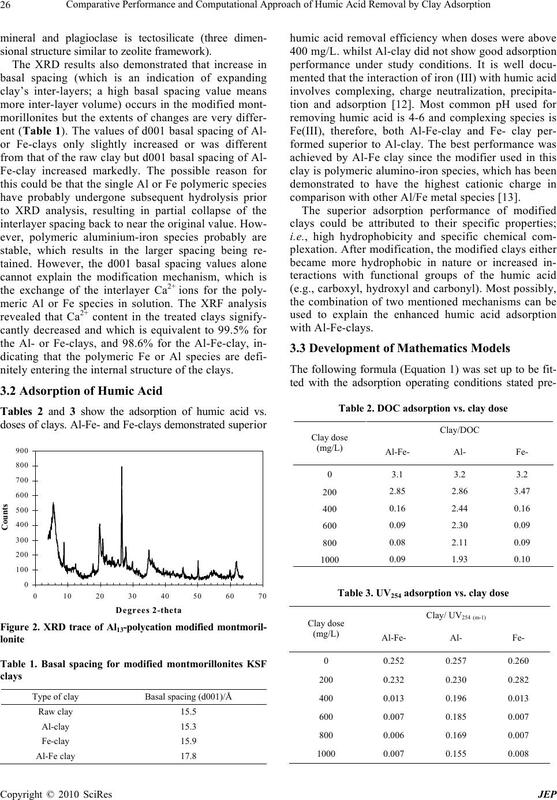 Al-modified clay had less removal capacity for adsorbing humic acid. using the developed model. The F test was used to validate t he model developed by examining if it fells into the reject field. be used to perform the simulation. been regulated in most countries’ environmental agencies. tions and common crystal structural characteristics. 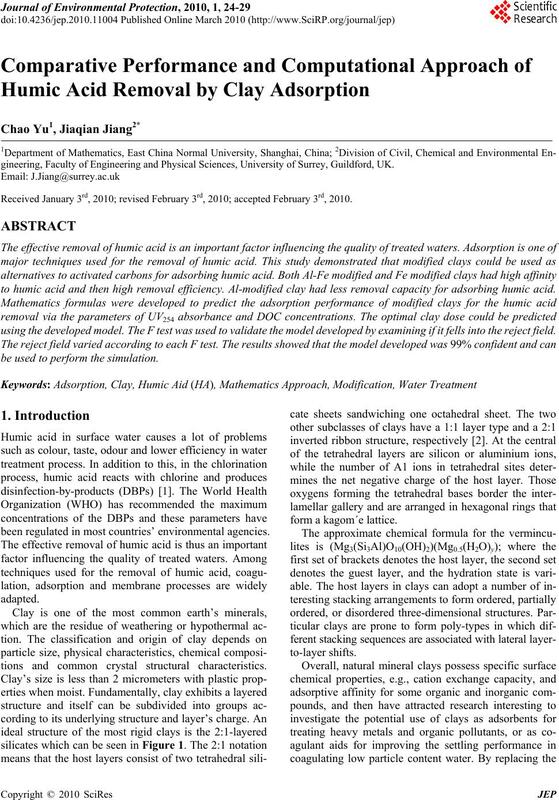 of adsorption of humic acid could be predicted. to reach the equilibrium status under the study conditions. F test was used to validate the model developed. sional structure similar to zeolite framework). nitely entering the internal structure of the clays. Tables 2 and 3 show the adsorption of humic acid vs.
comparison with other Al/Fe metal species . with each other when performing as adsorbents. 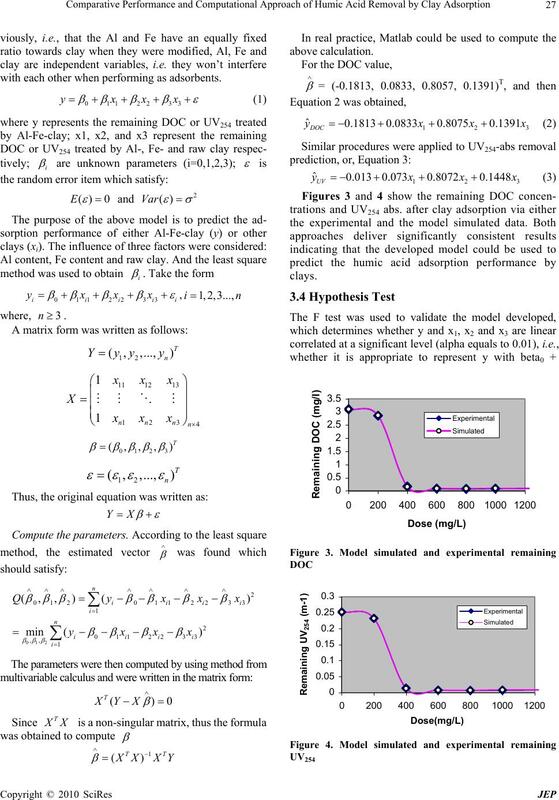 to simulate and predict the adsorption performance. model significantly at the 99% confidence. predicted using the developed models. used to perform the simulation. Society, London, pp. 495, 1980. Water Research, Vol. 32, No. 12, pp. 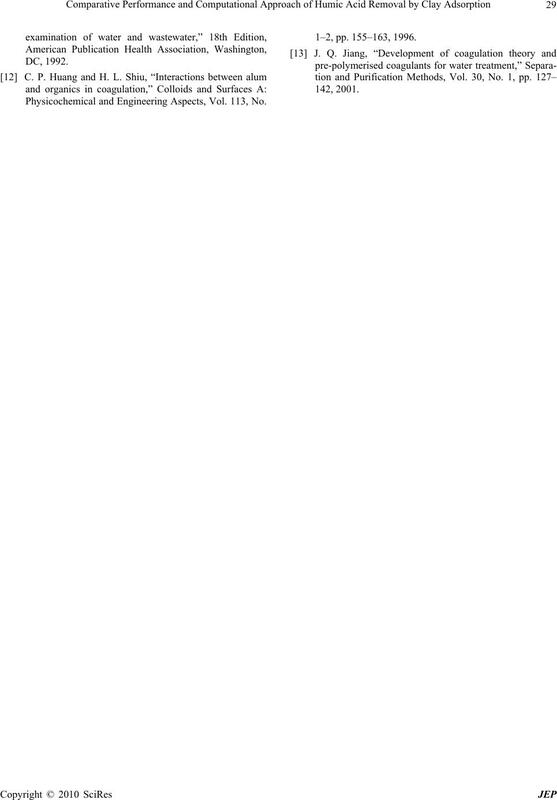 3710– 3716, 1998.
tal Technology, Vol. 17, No. 9, pp. 937–950, 1996.
nology & Biotechnology, Vol. 73, pp. 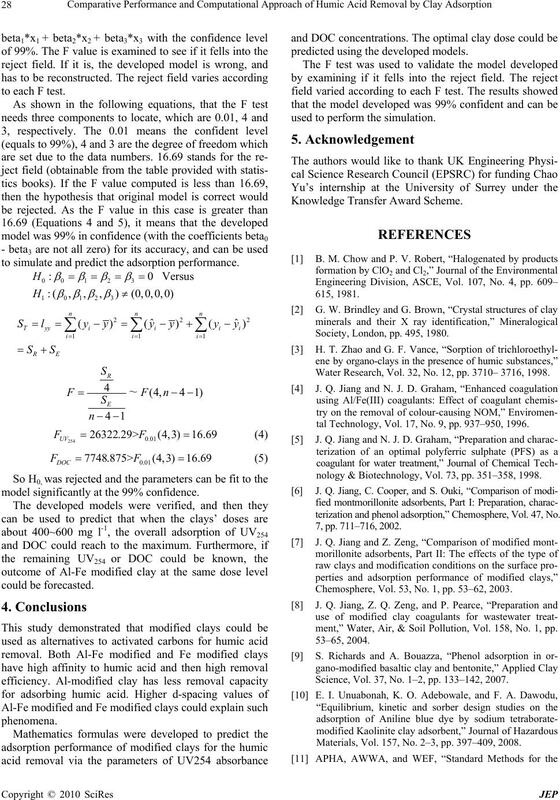 351–358, 1998.
terization and phenol adsorption,” Chemosphere, Vol. 47, No. Chemosphere, Vol. 53, No. 1, pp. 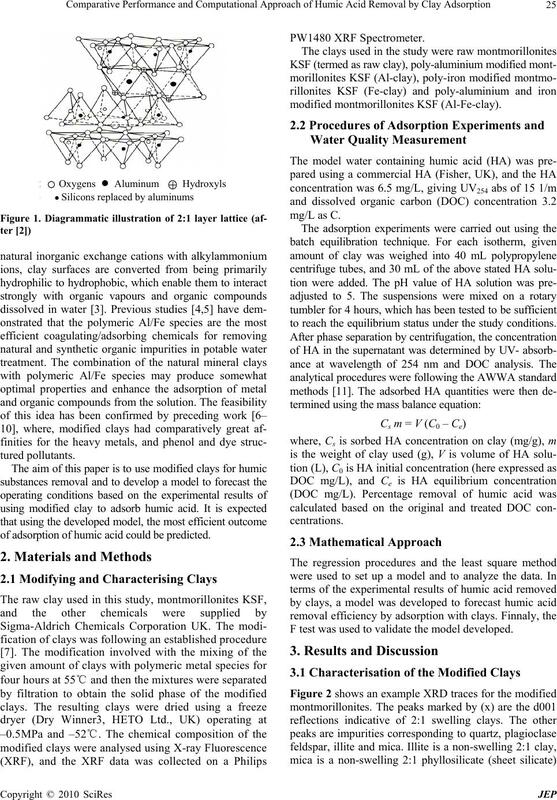 53–62, 2003.
ment,” Water, Air, & Soil Pollution, Vol. 158, No. 1, pp. Science, Vol. 37, No. 1–2, pp. 133–142, 2007. Materials, Vol. 157, No. 2–3, pp. 397–409, 2008. Physicochemical and Engineering Aspects, Vol. 113, No.